Victoria Cruz Teodoro of Malamig, Bustos, Bulacan wants her grandchildren to enjoy life on a farmlike she did, as she was raised by farmer-parents. They should, she believes, experience enough happy memories to encourage them to go back to farming in their prime years, like she did. Teodoro took up Bachelor of Science in Education at St. Augustine College in Baliuag, Bulacan but was not able to practice her chosen profession because she got married right after graduation to her childhood sweetheart, Anselmo S. Teodoro of Tibagan, Bustos, Bulacan. While raising their brood of four children, Teodoro went into the garment manufacturing business to augment the family income. Her factory specialized in company giveaways and promotional T-shirts. This exposed her to the corporate world and inspired her to venture into real estate marketing, becoming a licensed real estate broker. 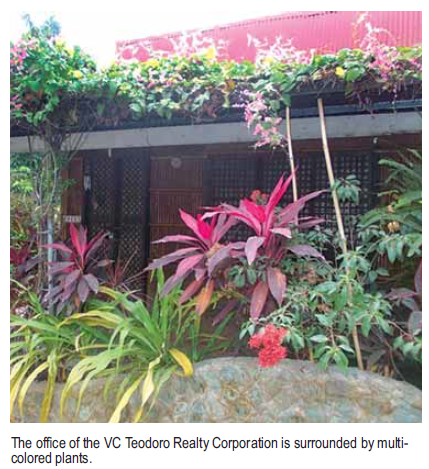 She then partnered with Bustos landowners to establish the VC Teodoro Realty Corporation. Their fifth project is called La Consolacion Village and is located at San Pedro, Bustos, Bulacan. Covering approximately five hectares, the propertyis envisioned to be a peaceful village and retirement haven for the residents of Bustos, especially returning OFWs. The company office building was built with recycled materials and planted to flowering and other ornamental plants to go with the rural theme. Their residence, which she calls the “old house,” is consistent with this rustic theme and serves as a weekend gathering venue for the family and her growing brood of grandchildren. A covered garden located between her house and office provides a sanctuary and resting place. She then allocated around 3,000 square meters of land for an integrated farm planted to assorted fruit trees like bananas, mango, guava, jackfruit, guyabano, calamansi, and native dayap. 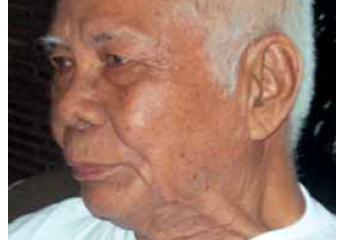 Teodoro then put up a vegetable garden in a fenced open area right in the middle of the subdivision. Its garden produce includes leafy greens and other occasional crops like peppers, eggplant, and tomatoes. The harvest is sufficient for for family use; any excess is sold or given as gifts to friends and other relatives. 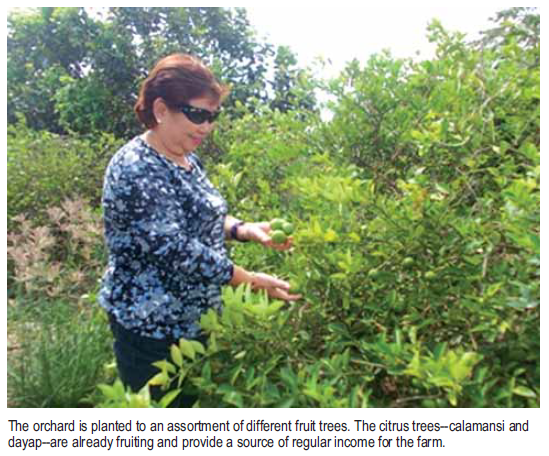 Her dayap and calamansi provide a regular income for the farm. To complete the integrated farm, a tilapia fishpond was built on one side of the lot. Water hyacinth used to feed her native pigs also grows abundantly in the pond. She also raised some ducks and chicken, mostly for family consumption. The farm needs a regular cash crop to make it sustainable. Being in the center of a subdivision, the endeavor should be acceptable and not be a source of nuisance to the community. It should also fit the small space allocated to it. 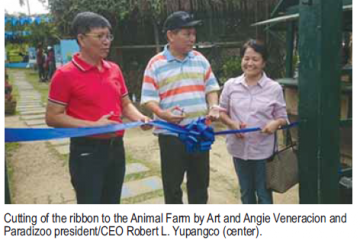 Teodoro met Art Veneracion in one of the farm tours she joined and was introduced to the idea of raising rabbits. She visited Veneracion’s Aven Nature’s Farm and was immediately convinced that rabbits would make a good addition to her farm. Attending the Rabbit Farming Seminar, she took note of the fact that she needs only a minimal amount of capital and a small space to set up a rabbitry. 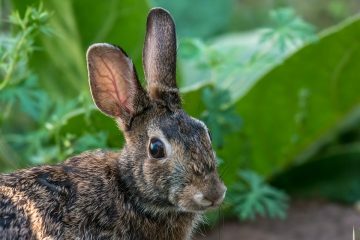 Rabbits multiply fast and are easy to care for; she is glad that the rabbit manure will provide rich fertilizer for her plants, trees, and vegetables. 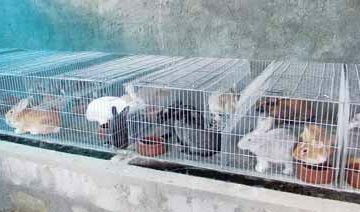 Teodoro then replicated the Aven model, in which African night crawlers are grown under rabbit cages (to produce vermicast). 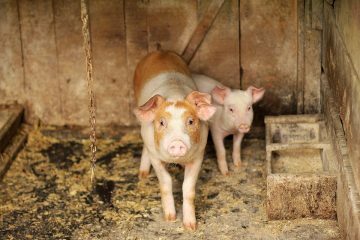 These can also provide an additional source of income to the farm. 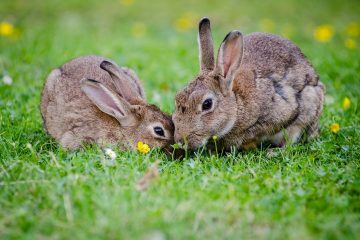 On top of these benefits, a rabbitry is quiet, and with the use of natural farming technologies, will not emit bad odors nor attract flies. Rabbits can also be cared for by children, and her grandchildren can participate in this farm activity. Starting with two does and two bucks, the rabbitry has grown and the animals are multiplying fast. Fully aware of the nutritional benefits of rabbit meat, Teodoro is looking forward to the day that her whole family becomes rabbit meat eaters and will be healthier. She also hopes that her grandchildren will keep the integrated, sustainable farm going.